After our Cycle Club gathering on Saturday, the boys all decided to hit the Keg for a round of drinks and to catch the second-half of the Arsenal vs. Everton game. Upon arriving at the drinking hole, we noticed a line of Harleys parked outside. 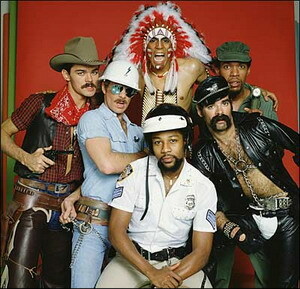 Walking inside, we spotted a bunch of leather-clad men occupying the bar – and they certainly were not the Village People! It looked like the ultimate Wild West showdown – the leather vs. the spandex, the horse power vs. the man power, the bikers vs. the cyclists – you get my drift. Some of the members of Cycle Club started to backtrack to a faraway table, but I was having none of that. I walked right up to the bar and ordered a…Cutie Fruity cocktail. Yeah, take that bikers – I went all out! Well, it turned out that one of the bikers was actually an old friend from my early MTB days and he ended up having a good chuckle with the rest of us about the similarities between our “riding” clubs. Our leather-clad counterparts also seem to have an exclusive club, uniforms, and meet every weekend for a run. Seems like we aren’t so different after all – except there’s just one problem, cyclists are much fitter, therefore we can’t hold our alcohol down – I still have a merry old hangover today! In other MTB news, newly-crowned Under-23 World Cup champion, Burry Stander, of Team Mr Price GT, won the Pick n Pay Asishove Mountain Bike Challenge in Pinetown on Saturday. Max Knox and Brandon Stewart (both of Team Garmin DCM) finished in second and third respectively.